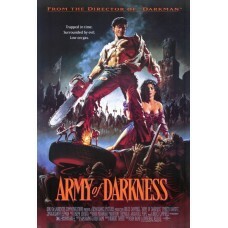 Army of Darkness Movie Poster 27 x 40 inch. This is a 1992 American comedy-dark fantasy film directed by Sam Raimi.Plot:After being pulled through a time portal, Ash Williams lands in 1300 AD, where he is almost immediately captured by Lord Arthur's men, who suspect him to be an agent for Duke Henry, with whom Arthur is at war. He is enslaved along with the captured Henry, his gun and chainsaw confiscated, and is taken to a castle. Ash is thrown in a pit where he fights off a Deadite and regains his weapons from Arthur's Wise Man. This movie was not the box office blockbuster, but after release on video it started gathering a massive cult following. This feature will make your Saturday night movie night. If you wish to keep your memories refreshed, we offer you this large Army of Darkness Movie Poster to decorate your home movie theater. And do not forget about some great popcorn, without which no movie night is really complete.Check out our popcorn packs and accessories. 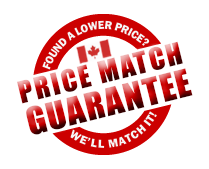 And as always, do not forget about our gift certificates.